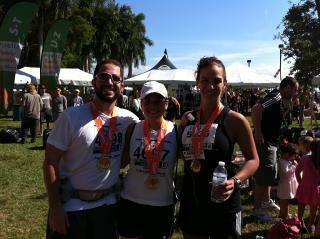 Having completed the Miami ING Marathon gives me a great sense of accomplishment. Nothing feels better than completing a goal that you have worked so hard for several months. Yesterday, the day of the Marathon, started at 4 am. As usual on race day I wake up and eat some oatmeal with milk, cinnamon, blueberries and some slices of banana. Get dressed while taking my first gel pack to make sure I start the race fully hydrated. Not much preparation in the morning as I already had everything laid out the night before. We were ready to head out by 5 am. walkers, people taking pictures, some video taping themselves as they ran and I would have to run around them. had planned to but for me feeling good was more important than time. So I kept the same pace. I was running with my friend Tanya who had been my training partner. We were both good with the pace we were keeping. pay to much attention to it but I did notice I was running harder on the other leg trying to compensate. When I noticed this, I immediately started stepping on both feet the right way even if it hurt. I just didn’t want to hurt something else by compensating for my ankle. Miles 16-18 I remember them as painful. I believe that somewhere between 18 and 19 I took an aleve. Slowly my pain started to diminished but now I was just tired. I had been taking my gels every 50 minutes. All along the race I knew when time was getting closer for me to take my Gu because I would start to feel hungry and I could feel my stomach asking for some consumption. soaked in ice water, and boy did that feel good! The course was shady for the most part until this short stretch so I was relieved to leave Key Biscayne and head back to Brickell. extra push I needed. And then… I look up and see the Brickell bridge, ugh! Not a big bridge but at mile 25 it’s definitely something. I just don’t know how I had the strength to run it as I saw many people walking the bridge. when you are this tired .2 of a mile can still feel very long. I just remember telling myself ” push through the finish, you just ran a marathon!” When approaching the finish line I looked down not to trip on the timing mats and put my arms up with joy. I got a bit chocked up but got myself together quickly and was off to look for family and friends that had been cheering all along the way. 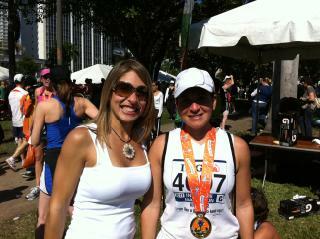 At 4:45 hours I’m officially a marathoner!!!!!!!!! !